The aims of the investigation are to identify the effect of bacteria, for example, what effect can Serratia marcescenspilli on red blood cells gives when mixed with molecular inhibitor. Also, to examine how pathogenic bacteria for example Clostridium perfringes produce toxin and what effect does toxin have on cells. In addition to the above, to examine the microbial resistance by using four different antibiotics by BASC method this will guide us to know the sensitivity and resistance to particular type of antibiotics. 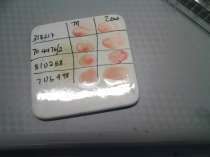 The table above shows the results which obtain after bacteria dilution were tested against erythrocytes. Table 2 shown the results when Serratia marcescens tested with erythrocytes to check for their ability to agglutinate in the presence of glucose, fructose, and mannose. The table above showed the production of toxin during bacteria growth. 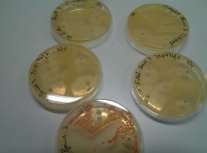 The disc of antibiotics show susceptibility is determined by measuring the diameter of the zone growth of bacteria inhibition. In the table shown above, the bacterium is susceptible to most antibiotics. Five organisms including Serrecia marscence and control were tested for the presence and absence of pili. These organisms were tested with erythrocyte to assess their ability to agglutinate in the presence and absence of different types of sugars. Serretia marscence is Gram negative organism, its genome code for pili on their cell surface because pilli are protein found on the cell surface of bacteria cell. Pilus is a contributing factor of microbial adherence to host epithelial cells. ( I. E. Salit,$ and E. C. Gotschlich) There are there are 2 classes of pili, these are mannose sensitive (MS) and mannose resistant (MR) of adhension One class is mannose resistant pili is capable to agglutinate erythrocyte in the presence of D-mannose known as type non-type 1 pili and second class mannose sensitivite pili adherence linked with mannose sensitive haemagglutination of chicken and guinea-pig erythrocytes and also known as type 1 pili (A. Hejaz and F. R. Falkiner 1997) .In addition Dhakal 2009 said Gram negative organism encoded pili and show significant role in cause infection of some of those of Gram negative bacteria. .
Agglutination test of bacteria were carried out on together with the control as shown on table 1, almost each bacteria dilution after gentle mixing with erythrocytes together with PBS on a slide, result in clear agglutination within 30 seconds on101 to 103 but weak positive observed on104 to 105 within 30 seconds. On table 2 show the result from the activity of Serratia marcescens pili by means of molecular inhibitor for example mannose, glucose and fructose. Mannose inhibited the agglutination since have the ability of preventing the adhesion of bacteria pili on to the cells. Therefore Serratia marcescens has type 1 pili since it is mannose sensitive, mannose prevents the adherence by protecting cell surface receptors, therefore inactivates the bacteria pili to adhere to the red cells. In place of glucose agglutination occurs in 15 seconds and fructose was showing agglutination within 35 seconds therefore glucose and fructose has no influence to act as inhibitor. Both glucose and fructose are able to absorbed with erythrocytes but unable to stop the adherence. 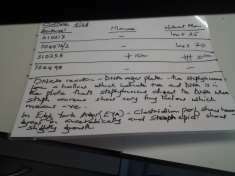 Additionally, agglutination was much slower in control in the presence of glucose and fructose. A simple analysis to investigate the haemolysis of red blood cells used in identification of Streptococcus pyogensand Streptococcus sanguis reaction on blood agar. Hemolytic type reactions used to categorize strains of Streptococci, the hemolysis that is related with extensive lysis of erythrocytes surrounding the colony is known as β-Hemolysis while hemolysis associated with lessening of erythrocytes and produce greening hemolysis is known as α-hemolysis (www2). Result on table 4 show there was a wide haemolysis around the Streptococcus pyogenscolony known as beta haemolysis. Streptococcus .pyogens belongs to beta haemolytic group and produce virulent factors such as pyrogenic toxin which play role in haemolysis and produce a clear zone (www 2). There was no haemolysis around the Streptococcus.sanguinis which means it would be simple to investigate these bacteria through their toxins. Especially that S.sanguinis is partially destructing the erythrocytes and belongs to alpha haemolytic group. 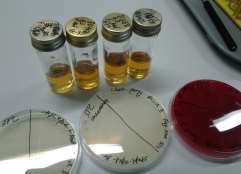 Four bacteria were tested according to BSAC method to investigate antimicrobial susceptibility. Cephalosporin’s group was used and cephalosporin is a group of Beta-lactamases antibiotics. The 1stgeneration cephalosporin antibiotics have much effect with gram positive bacteria and less effect against gram negative bacteria. However gram negative bacteria are more effective to 3rd generation and 2nd generation are more active than1st generation. To improve the experiment more study is necessary to correct the mistakes in the investigation, thus to have good results. However generally the experiment went good mainly in haemolytic test where Streptococci pyogens show clear zone of haemolysis when clear the colour of the agar as they breakdown erythrocytes as we expected.